The penthouse is situated in private gated grounds a few minutes walk from the beach on the beautiful Atlantic coastline of the island gem of Isla Canela. The apartment sleeps six, having three tastefully furnished bedrooms, two of which open onto the western seaboard. The master bedroom also has a full ensuite bathroom. There is a family bathroom, fully equipped kitchen and a large living room which opens onto a truly magnificent sun bathed terrace which boasts the finest views and sunsets on the island. The terrace is equipped with tables, chairs and shaded area for relaxed convivial outdoor dining. There is also a raised jacuzzi. A dedicated lift will bring you and your guests straight from the underfloor gated car park to the penthouse. Beneath you lie beautifully manicured gardens, large swimming pool , tennis courts, play area, showers and privately gated access to the beach. Active Holiday or Relaxing Rest: The geography and ambient culture of Isla Canela combine to make it a truly refreshing area in which to unwind, whether through the host of available recreational activities, or, by simply lying back, relaxing and chilling out to the rhythms of the waves falling on the beach at night and the village culture of the fishermen of Barrio de Canela and Punta del Moral. Activities there are aplenty - fishing, swimming, windsurfing, cycling, beach volleyball, jogging, walking, golfing, tennis, boating and sailing. Or watch the local villagers celebrate the fiestas with fireworks, mule races, music and dancing from Ayamonte to Villablanca and back. Or relax over coffee and churros in Ayamonte, enjoy a lunch of grilled sardines and chilled wine in a beach 'chiringuito', have a siesta, and then stroll with the Spanish families along the lighted marine promenade, before heading out for a late evening dinner. Or savour your own freshly caught fare as the Western sun sets over the terrace. In Spain: The town of Ayamonte lies over the bridge, some 15 minutes from the island. It is a vibrant bustling Spanish town, peppered with pleasing walks, generous plazas, and alfresco dining - locally caught and marketed fish enjoy pride of place together with excellent Iberian hams and reasonably priced good quality wines. Its citizens are proud of their culture and traditions, as exemplified in their fiestas, processions and dance and music festivals. The town and its citizens exude hospitality and while many are happy to use English, they are very pleased if their guests try out their Spanish. The fast food chain, litter, loud thumping music and wall-to-wall soap coverage culture has been successfully resisted. This is very much a traditional Spanish town, in which one cannot fail to be impressed by the scores of multi generational family outings of toddlers, teenagers, adults and grandparents happily relaxing together over long family meals into the wee small hours. In August,usually 15/16 ,there is an open air art festival which is well worth a visit. Just across the River Guadiana lies the Portuguese town of Vila Real de Santo Antonio. It also has a vibrant marina, and pleasing riverside restaurants. Walking from the marina into the town one can find great bargains in the port and wine shops, and, in the many linen outlets. Heading due west on the motorway will - in little more than 90 minutes - bring you to the most westerly point in continental Europe - the windswept fastness of Cabo de Sao Vicente lighthouse. The 90 minute trip east from Ayamonte brings you to historic city of Seville, the capital of Andalucia, with its old quarter housing its magnificent cathedral, with its famous Moorish Giralda Tower, and the nearby Alcázar palace. Nearer to Ayamonte and Isla Canela is the regional 'shopping' hub of Huelva. Car recommended. NB - Pool opens for the first two weekends in June, then full time from the 15th June until the 15th September, then for the last two weekends in September. Fee of €10 per day to have jacuzzi heated. Beach towels not supplied,but may be hired. Play area for young children. Pool opens first two weekends in June, and last two weekends in Sept. Opens daily from 15 June to 15 Sept.
Housekeeping services can be supplied. Great location 10 minute to restaurants and a beach bar 3 minutes away who do great food. Roof terrace spacious and apartment lovely great pool plenty of sun loungers. So glad that Mr &Mrs Hendry enjoyed their holiday. Happy to have them as guests. Very comfy and smart. Tremendous views over the ocean. Six of us fitted well without being on top of each other. Good kitchen equipment not to complicated for holidays. Sitting room and large terrace well appointed. Overall the property was in excellent condition. Thank you for taking the time to submit a review--greatly appreciated. It was a pleasure having Charles ,Tizzi and friends stay in my apartment. Very small kitchen and only a small dining table for four people which isn’t ideal for a family if the weather isn’t good. However there’s good parking and is in a good position for the beach, restaurants and walking. The penthouse is on a beautiful new urbanisation, just In front to the beach. It has a great terrace with wonderful views to the sea and magnificent sunsets. The apartment has been well decorated and everything was in perfect condition and clean. The rooms are comfortable and the bathrooms have a good size and are brand new as well, decorated with a very good taste. The air conditioner in every room is a great thing to have on very hot days. Owner and management very helpful and available. We'll definitely go back in the future. I am so glad that they enjoyed their holiday in Isla Canela . Thank you Maria for taking the time to write a review. What a beautiful top floor apartment with huge sunterrace and jacuzzi. The expansive view of the sea on your doorstep was simply magnificent, both day and night. And with a massive pristine beach so close, our most difficult daily decision was "Beach or Pool?"!! The kitchen was very well stocked and a fabulous welcome pack was waiting for us. The local agent was extremely helpful. We had a very relaxing time and would highly recommend it. Thanks for everything, Kate. Thank you to a lovely family for your review. I am so glad that you all enjoyed your holiday in Isla Canela. Hope you come back another time. The penthouse apartment was as described. It was airy and very spacious with a fabulous roof terrace with great views of the pool and coast. Good location with promenade to two resort centres outside. Recommended. Katherine was great to deal with and helped us out when needed. Sue and her family were the perfect guests. Left apartment in excellent condition. Great that they enjoyed their stay. Air conditioned beach front penthouse in an exclusive gated community on Isla Canela. The complex has the biggest, pool on the island, tennis courts, a children's playground, showers, loungers, toddlers' pool, secure parking, lifts, etc. The island is the hidden gem of Costa de La Luz, 15 minutes from the beautiful Andalucian town of Ayamonte. Fishing, swimming, windsurfing, kite surfing, boat trips, a 2 mile lighted pedestrian promenade and restaurants serving freshly caught fish, lie on your doorstep. 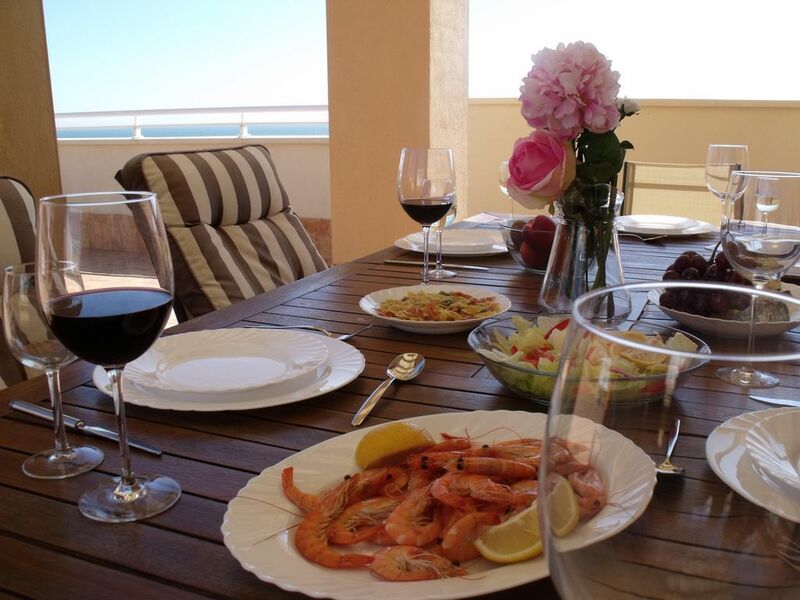 A few kilometres away lie golf courses, the romantic fishing village of Punta del Moral, the Marina and Ayamonte, with a wide variety of excellent restaurants, an incredible fish market, shopping and fine wine outlets. Enjoy Ayamonte's International Classical Music Festival,and open air Art Exhibition in August, marvel at the historic beauty of Seville, 90 minutes away or take a 20 minute drive or ferry to Portugal for a coffee and fine port or three in Vila Real de Santo Antonio! Golf: There is an excellent golf course with a well appointed welcoming club house, bar and restaurant, some 5 minutes away on the island . Some 20 minutes away is the new Costa Esuri Golf Course. The Portuguese Algarve Golf Courses of Castro Marim, Quinta da Ria, Quinta de Cima, Monte Rei and Qinta do Vale can all be found within 45 minutes. Ski: There is of course no skiing! but there is walking, fishing, swimming, banana boating, the nature reserve, sports marina, windsurfing, kite surfing, cycle hire, the marine promenade, beach front chiringuitos, countless restaurants, the fish market, wine shops, golf, two football stadia, the bullring, the International Clasical Musical Festival, language schools, watching the trawler fleet return to Punta del Moral, savouring their catch that very night in Punta's myriad restaurants, fireworks and fiestas in Ayamonte and nearby Villa Blanca, religious festivals, mule racing, beautiful churches, the ferry (or, the bridge) to Portugal, the Portuguese frontier town of Vila Real de Santo Antonio, with fine port and linen bargains galore. Visit the stunning architecture of old Seville, the old mining community of Rio Tinto, take a boat trip out to sea or up the frontier River Guadiana ..... or .....relax in the terrace jacuzzi as the sun goes down on your rioja or chilled vino blanco! Cancellation Policy -- 100% refund if cancellation made 8 weeks before due date of arrival. NB. Beach towels are not supplied. However, they may be hired for €5 each.